New Zealand and the sports world is mourning the death at age 40 of rugby superstar Jonah Lomu, from complications associated with the kidney disease he had long been afflicted with. Jonah was a great man, on the field and in life. I was at the Rugby World Cup semi-final in South Africa in 1995 for the All Blacks’ game against England. Jonah touched the ball seven times in the game and scored four tries, including arguably the most famous try in rugby history when Jonah ran over Mike Catt on the way to the try line. It’s said that this was the moment that prompted Rupert Murdoch to buy the television rights for southern hemisphere rugby. (See all of Jonah’s 15 World Rugby Cup tries here). Jonah was a frequent visitor to my Auckland home, and a friend to my daughter Bex. I’ll never forget one get-together we had in San Francisco in 1998. 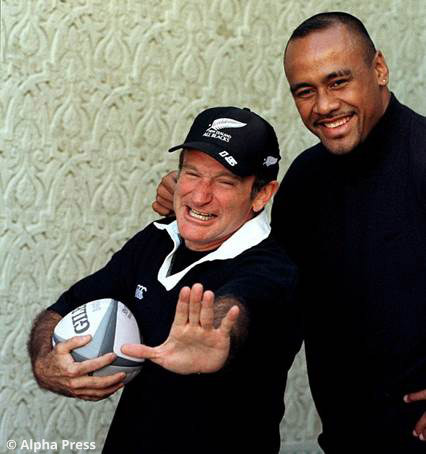 In August last year I wrote a tribute to Robin Williams who had just died, recounting a memorable photo shoot with the actor and the rugby player. The postscript to this story happened that night at the end-of-event party for the State of the World Conference in the penthouse of the Fairmont Hotel on Nob Hill. The room was stacked with political leaders, US Senators, Nobel Prize winners, captains of industry, change agents…and the person they all wanted to meet was Jonah. He stood in a corner of this famous hotel suite, the last person in the room to elevate their own importance, and received people with the grace and humility that characterized his life. It has been written that Jonah was the most famous New Zealander, perhaps more so than Ed Hillary, or aviator Jean Batten who was the most famous woman in the world at her time of epic flights over lonely oceans. It’s a sort of academic exercise, a fame counter, but it does in one way serve to place Jonah Lomu in a pantheon of supernovas who have inspired our purpose. If New Zealand’s purpose is to “win the world from the edge,” then Jonah Lomu is on the team, forever wearing the #11 jersey.